How to disable Zentail from sending product data to Amazon on a per SKU basis. Use Amazon product data sync override on a per SKU basis to preserve existing product data on your Amazon listings. You can enable or disable Zentail to send product data to Amazon for individual SKUs. This allows you to send updates to Amazon for a specific set of SKUs and not your whole catalog. This is useful if you would like Zentail to leave certain SKUs in your Amazon seller central untouched. A common use case is when sellers have Enhanced Brand Content on some Amazon listings because Amazon does not allow integrations to manage Enhanced Brand Content through feeds. Product Data is independent from pricing or inventory feeds. This override does not affect Zentail's ability to send pricing or inventory feeds to Amazon. Use the (Amazon) Product Data Sync Override attribute in a new custom template. Add SKUs to the .csv spreadsheet and set the attribute. - 1 or True = Override is turned on, so product data is disabled, regardless of the settings on your integrations page. 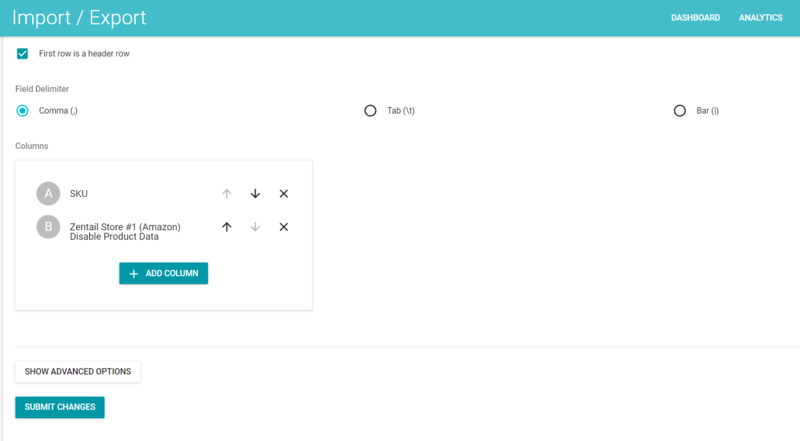 - 0 or False = Override is turned off, so the SKU will follow the settings on your integrations page.